The Shitennou (the "4 Kings of the Sky", in japanese) are high powered villains, who serve Queen Beryl, herself the servant (and sometimes mortal vessel) of Queen Metallia, a kind of evil goddess. They are on top of what seems to be an evil empire, situated underground under the North Pole and/or in some parallel evil dimension. I sometimes call them Generals due to the military outfits and because it was their title in the French version. But more usually, I call them Shinma (God-demon), a word picked up from "Vampire Princess Miyu", because the Dark Kingdom demons are referred to as "youma" and I decided that the Kings were a kind of superior species of these. Some centuries ago, Metallia's armies, led by the Shitennou, attacked the Moon Kingdom. They nearly took over it, and managed to kill Princess Serenity, the Moon Queen's only daughter, and Prince Endymion, the Princess's fiancé from Earth (whom Beryl has the hots for, too). 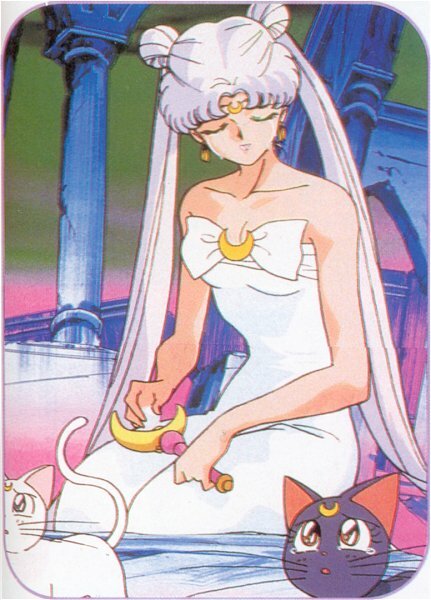 Seeing her kingdom destroyed and her only child dead, Queen Serenity used the greatest power of the Ginzuishou (Silver Crystal) : Metallia was sealed into a crystal prison for centuries, along with her armies (or so we're left to assume), while the essence of Princess Serenity, her 4 faithful Planet Guardians (Mercury, Venus, Jupiter and Mars), Prince Endymion were sent to Earth until they'd be reincarnated. The Queen's counsellors (two talking cats named Luna and Artemis - surprisingly, this one is male) were sent to Earth in lethargic devices to be awakened when the Moon princess would be reborn. 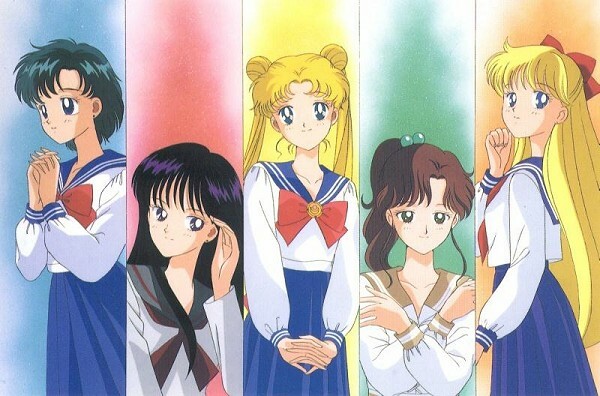 Later the cat will also "recognize" Sailor Mercury (Ami Mizuno), Sailor Mars (Rei Hino) and Sailor Jupiter (Makoto Kino). Last, Sailor Venus (Aino Minako) - who actually had become a super-heroin before Sailor Moon herself - will join them - she's been "found" by Artemis and used her powers under the name of Sailor V before Luna even found Usagi. 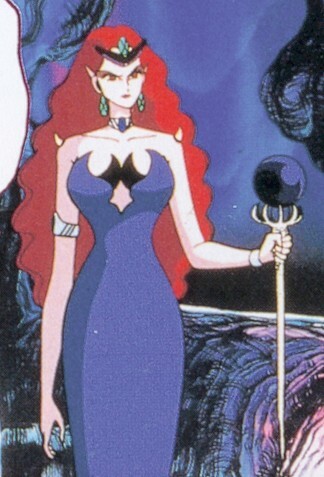 The first member of the Dark Kingdom to be met by them is Jadeite, whose mission is to collect life energy from humans to free Metallia (whose seals are stronger than her servants', and haven't been broken). He had some victories, but also some failures, especially as a masked hero in tuxedo (Tuxedo Kamen = "Tuxedo Mask", also called by me "the masked Penguin", because I loathe him) appeared every now and then to counteract his schemes, when Sailor Moon wasn't enough. Actually, in case you haven't figured yet, Tuxedo Kamen is the reincarnated Prince Endymion, who hasn't recovered his memory either. 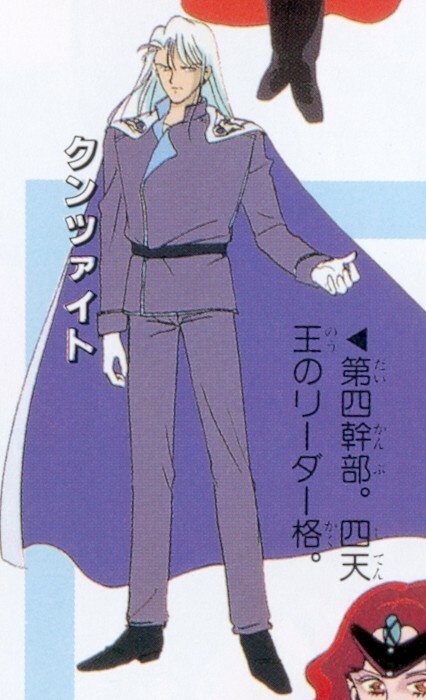 His reincarnated self is Mamoru Chiba, a guy slightly older than the Senshi (he's a student, I think? We never see him working), who stumbles on Usagi quite often. The two cordially hate each other. 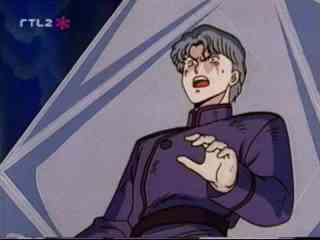 Jadeite's last failure cost the life of one of Beryl's personal servants, Thetys, who apparently fancied him enough to help him of her own device. As a punishment, he was imprisoned in an ice coffin forever by Queen Beryl.